As the year comes to an end, we wanted to look back and celebrate what has been undoubtedly our best year yet. 2018 was a year of growth and impact for Latinas in Tech. We are proud to now have more than 4,000 women and seven local chapters that make up the Latinas in Tech community. We are proud of the steps we’ve taken to grow our community, and are so grateful to everyone who has supported us throughout the year in such meaningful ways. Los Angeles, Sacramento, New York City and Miami now have a local Latinas in Tech chapter! Chapters in different cities bring a myriad of perspectives and opportunities for Latinas working in the tech industry. We are so grateful for our chapter Board Members who are stepping up to organize local activities, expanding our reach and enabling us to further our mission in such amazing ways! 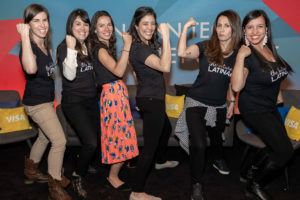 In an effort to continue building strong bridges between top Latina talent and tech companies, we launched the LiT Career Hub in May. 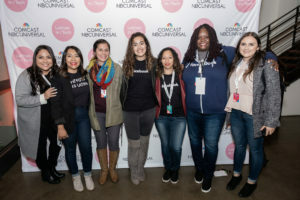 The LiT Career Hub was made possible thanks to the support of Comcast, who provided a generous grant to further our mission of connecting Latina talent to the tech industry. Since our launch, more than 98 companies have shared 210+ job opportunities on our platform. Through the LiT Career Hub, you can search for career opportunities using keywords that align with your expertise and filter by location, sector, and skills. On the employer side, companies are able to post jobs that will be featured in bi-weekly emails to our Latinas in Tech database, and gain access to new and diverse talent pools. In May, we also introduced a new event format: LiT Recruit, a speed networking event where participants have the opportunity to meet recruiters from different tech companies. This year’s event included representatives from Comcast, Evernote, Facebook, Google/YouTube, Indeed, LinkedIn, Pinterest, Uber, Visa, Workday & Zendesk. We hosted our second LiT Recruit during our annual Summit in November and remain laser focused on widening opportunities for our community. We look forward to hosting many more LiT Recruit events in 2019. In June, we launched our Latinas in Tech Leadership Series, a hands-on career workshop led by executive coach Lucrecia Iruela. These workshops were designed to help members from our community grow in their professional career, whether just starting or more senior in their trajectory. Next year, we look forward to continue creating professional development opportunities for all our members. This year, we celebrated the second annual Latinas in Tech Silicon Valley Summit. The event brought together more than 300 participants from across the U.S. and Mexico. More than 30 speakers took the stage throughout the day, and showcased the diversity of talent and backgrounds. 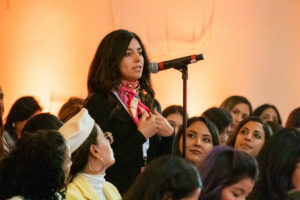 We had engineers, investors, business leaders, creators and dreamers share their experience with attendees on topics like how to get a seat at the (leadership) table, how to build a movement through women in tech organizations, how to go after your moonshot ideas, and the status of investing in Latinas, to name a few. We were honored to have a very special guest, the Mayor of San Francisco London Breed, who shared with us her vision for how her administration will fight to support underprivileged communities. We closed out the full-day of inspiring keynotes and panels with a LiT Recruit networking happy hour and in true Latina fashion, impromptu samba and salsa dancing. Thank you to our generous sponsors for supporting our Summit: ComCast NBC Universal, Visa, Asana, Facebook, Twilio, Zendesk, Prezi, Airbnb, Turo, Twitch, HomeAway, Salesforce, Pinterest, Stripe, Uber, Maniak, and Solière. We look forward to making this signature event stronger and better in the coming year. Thank you again to all our partners and supporters, and to all the Latinas who make up our community. You are what fuels us, inspires us, and makes us better. Today is an exciting day for Latinas in Tech. Today is a day that shows that authentic passion and drive for making an impact and helping Latinas advance in the tech industry is being recognized. Recruiting programs, such as the LiT Recruit event we are hosting in San Francisco on May 23, and the launch of a new LiT Career Hub that will connect our Latina members with job opportunities within tech companies, while serving as the bridge for tech companies that want to diversify their talent. Mentoring programs to foster the advancement of Latinas in technology careers. Providing hands-on leadership workshops and online professional development opportunities. These funds will also support LiT’s Annual Summit, which will take place on Nov. 15, 2018 in San Francisco. And at the core, we will continue hosting our regular Latinas in Tech Meetups and even increasing their frequency, while introducing new chapters throughout the country. Rocio and I had the honor of meeting Lorena Hernandez, the Community Impact Director for Comcast in California, last year during our Latinas in Tech Silicon Valley Summit. Our admiration for her was mutual, Lorena is leading Comcast's efforts to support organizations that drive an impact in the community and in the tech industry. In Lorena's own words: "Latinas in Tech’s mission aligns perfectly with Comcast’s commitment to investing our resources in ways that help communities realize the transformative potential of media and technology to solve problems, improve lives and to create opportunity. Comcast is proud to partner and invest in Latinas in Tech for their ongoing strategic focus on empowering and educating Latinas. We believe this investment will help create a more diverse workforce in the technology industry". We are beyond grateful to receive this contribution from Comcast. These funds will allow us to take our efforts to the next level and further enhance our mission of empowering Latinas working in tech. We look forward to all the great things we will accomplish together with the support Comcast. Thank you / Gracias / Obrigada Lorena and Comcast for believing in Latinas in Tech! We're excited to announce that Latinas in Tech will be expanding to three new cities: New York City, Los Angeles, and Sacramento! Each new chapter will allow us to further our mission to connect, support and empower Latina women working in tech. 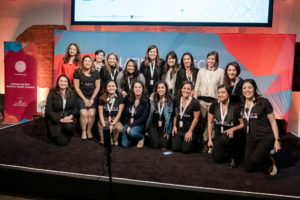 After four successful years, and with more than 2,000 women in our current membership across Silicon Valley, Austin, and Mexico City, these new chapters will allow us to deliver professional development, recruitment and mentorship opportunities for Latinas who are looking to grow in their careers more than ever. We want to be a catalyst for elevating Latinas working and leading the technology industry, and we want to have your back in the process. Now we have more places to make sure that happens. We will be hosting launch events in each city, please be sure to share the news and invite your fellow Latinas in Tech to the events! We also invite you to visit the new chapter sites so you can learn about the local Board Members. Bienvenidas Latinas in Tech in NYC, Sacramento, and LA!